Picture Books You Can Sing! Early literacy is what children understand about reading and writing before they can actually read and write. The building blocks of language and literacy form in the first three years of a child’s life. Early childhood experiences impact how a child’s brain will develop. The Library offers a wide variety of materials and programs to support early literacy! Portland Public Library’s early literacy initiative Every Child Ready to Read @ Your Library ® is a project of the Association for Library Service to Children and the Public Library Association (divisions of the American Library Association.) This parent education initiative stresses that early literacy begins with the primary adult in a child’s life. Developing early literacy skills has a long-term impact on children’s reading achievement and academic success. We offer several story times designed for kids from birth to age 5 at all of our locations, from basic rhymes to movement and music. 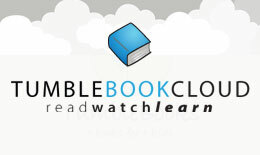 Join us and cultivate a love of reading in your child early on! The Sam L. Cohen Children’s Library is excited to host the Maine Academy of Modern Music’s The Kids Are Alright, a family friendly local music series aimed at encouraging children’s involvement in the musical arts. This series will take place on the first Saturday of the month (except for our December 2018 concert) at 10:30 for our in the Portland Public Library’s Rines Auditorium. In addition to live performances by some of the area’s top talent, each event will feature a “Get-To-Know-Your-Local-Musician” component that will allow parents and children a chance to ask the performer(s) questions about what it is like to be a musician in Maine. Likewise, MAMM will host an “Instrument Petting Zoo” so that everyone will have a chance to try out some of the instruments that they will have seen used on stage during the performance that day. The Library will provide concert attendees with resources about the importance of music in the early literacy and brain development of young children. This series in funded in part by the Davis Family Foundation. Join us the first Thursday of each month for a lively Spanish Story Time with Lisa Ha-Ngoc. 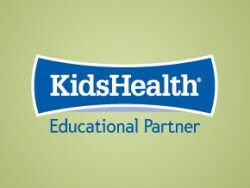 This program is for children ages birth-5 and their caregivers. A performer at heart, with a love of teaching and singing, Señora Lisa delights audiences of all ages with her engaging activities and enthusiasm for the Spanish language. 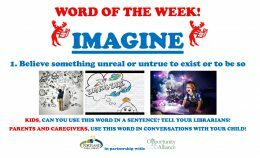 In partnership with the Opportunity Alliance each week we will post a new vocabulary word to use in every day conversations with children!